Want to brush up on your knowledge of the British Monarchy? But don't want to wade through boring, long-winded books with old fashioned designs that make your eyes hurt? Then this is the book for you! 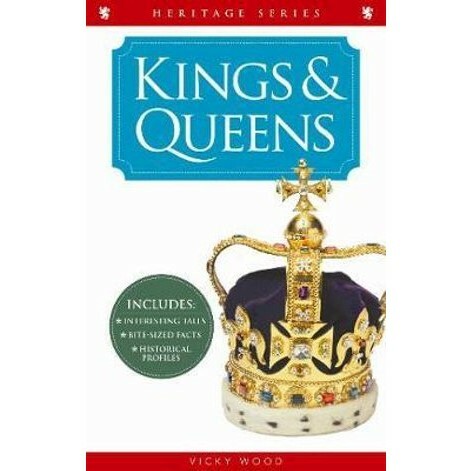 Kings and Queens is a colourful, pocket-sized guide all about the most famous royals in the world that you can enjoy browsing through at home for general interest or that you can take with you as you travel about the country. 'Did you know' trivia that will make you laugh and groan! Learn everything you need to know about this fascinating aspect of British heritage with this handy fact-filled guide. Vicky Wood is a qualified Blue Badge Guide who leads tour groups all over Britain. Vicky is a walking encyclopaedia on Royal history with a passion for history.